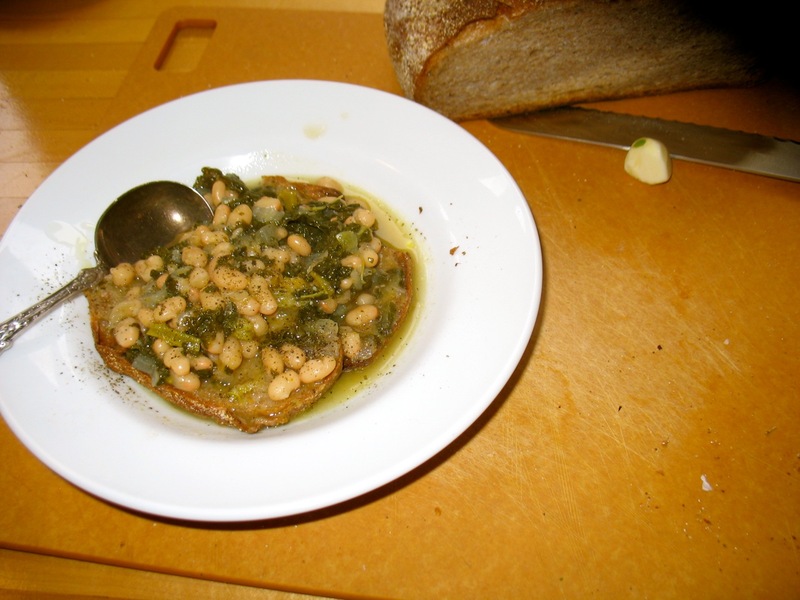 Bread, toasted and rubbed with garlic, soaking up a kale and white bean stew. Bread came to the rescue this weekend. A dear friend was visiting (the one for whom the wedding cake was made) from out-of-town. She showed up on Saturday mid-afternoon and both of us happened to be starving. I had some day-old white bean and kale soup on the stove. It was a fine soup, a good soup really, but there wasn’t a whole lot left. So I toasted a couple of slices of bread, rubbed a garlic clove across the warm slices, covered them with hot soup, drizzled on a little good olive oil and a bit more salt . . . And we enjoyed a most satisfying mid-afternoon meal. Bread comes to my rescue a lot actually. In savory bread pudding, in bruschetta with stewed leeks, for quick lunches with a salad, for soaking up the tomato sauce in which I poach eggs, etc. Bread has been getting a bad rap lately and I want to counter some of that with a little bread appreciation today. And I do know and understand that some of you can’t tolerate bread and I’m not trying to rub it in, but for the rest of us, it can be a handy, tasty and nutritious life-saver. And of course it truly is a life saver in much of the world. A vast percentage of the world’s population subsists primarily on a variety of grains and for more than six thousand years people have been baking leavened breads with many of these grains. After many years of making the no-knead bread made famous in the New York Times I still swear by it. I make a whole wheat version with 75 % whole wheat flour*, which is what you see above. 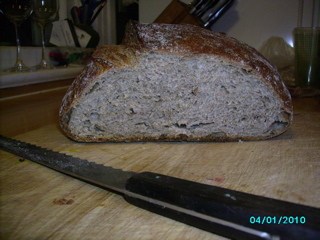 It has a wonderfully open and airy crumb, loads of flavor from the wheat and the long rising period and a serious crust. It is definitely my pinch hitter. . . yesterday I toasted a slice and slathered it with almond butter as I ran out the door to pick up my son. It’s one of his favorite snacks and mine as well. Yesterday I also made dinner for friends who just had a baby. I made winter squash and onion panade (for which I’m going to post the recipe soon) which consists of stale bread turned into a gratin with caramelized onions, diced winter squash, veggie broth and cheese and a raw kale salad with hearty bread crumbs and a garlicky lemony dressing. 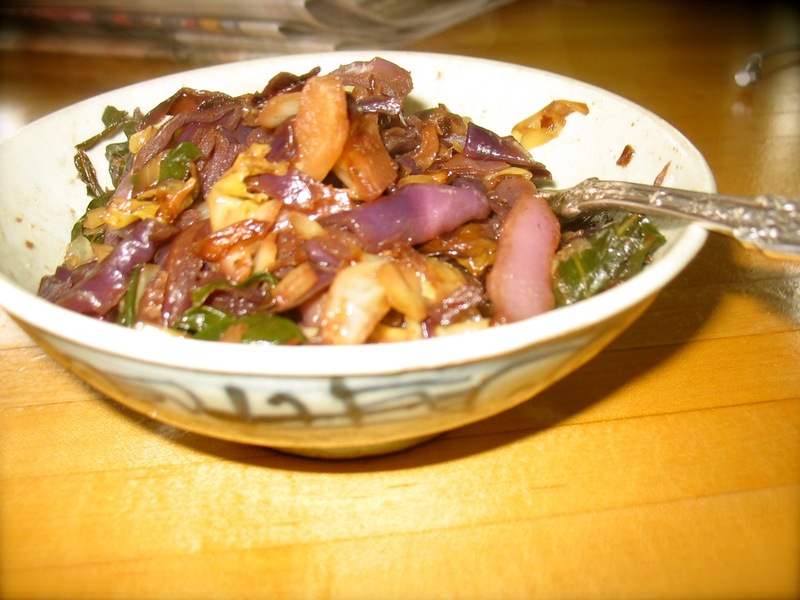 Because of bread’s long history, most cuisines/cultures have ways to use up the stale stuff which I think merits a post in-and-of-itself soon. Until then . . . Happy Cooking and Eating! * A quick note on flours. It’s important that you use bread flour in this kind of bread since it’s made from wheat that has a higher percentage of protein/gluten (than all-purpose flour) which is what gives bread its strength and structure. 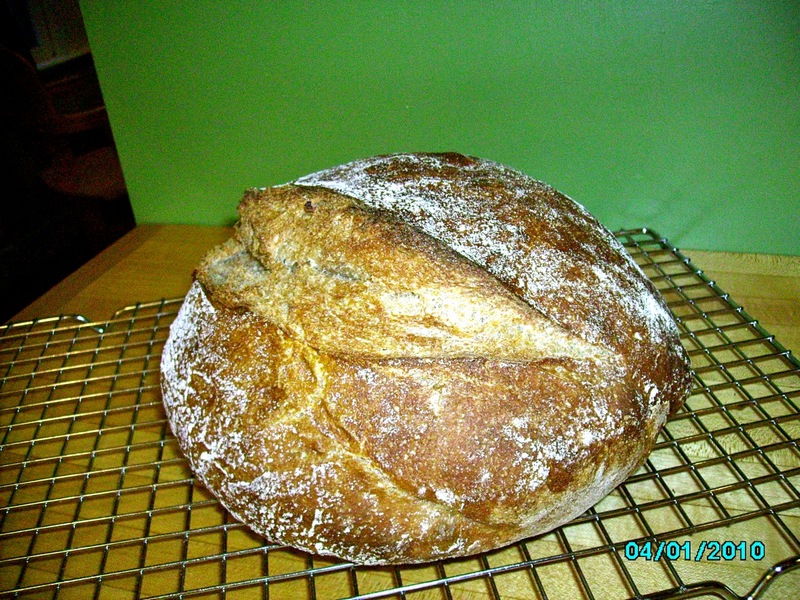 I like using Stone Buhr’s Whole Wheat Bread Flour or Bob’s Red Mill. Like so many people, I’ve been making the no-knead bread made famous by Mark Bittman’s NY Times piece three or four years ago. 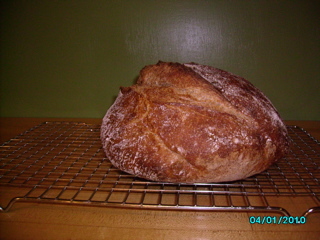 I now regularly make this loaf with 75% whole wheat (using Shephard’s grain whole wheat flour) with magnificent results. 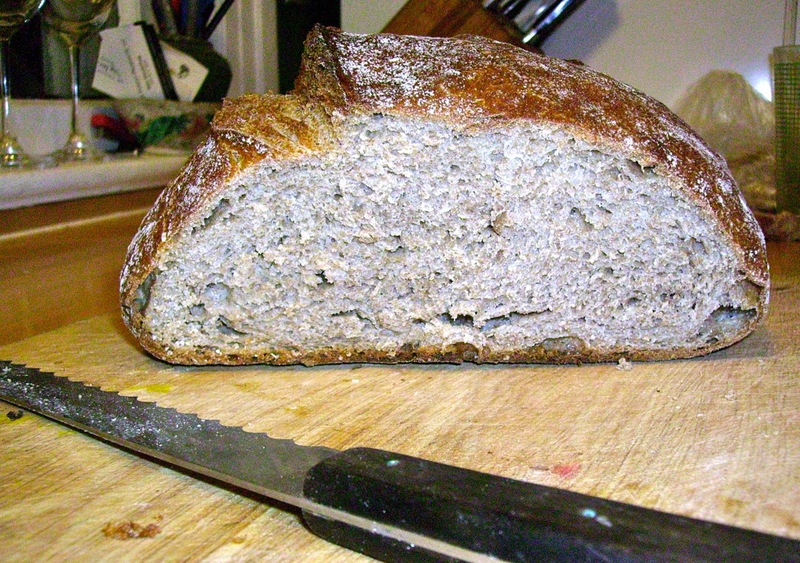 the crumb is open and the texture chewy and the crust, crackly and toasty brown. I’ve decided to focus one of my upcoming classes on the many uses for bread (not in a sandwich kind of way) as part of dinner. I tend to still have a 1/4 of a loaf leftover (for fear of running out) when I pull a new one out of the oven and then we want to eat the new one, fresh with butter or cheese as a snack or make sandwiches. 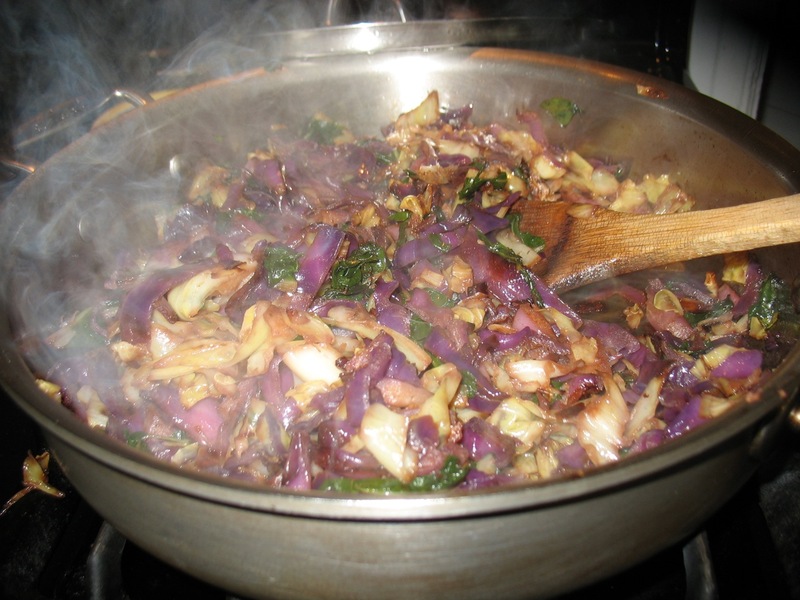 Maybe that’s why I have such a repertoire of dishes that incorporate that last 1/4 to delicious effect. Many cultures/cuisines have used up bread in creative ways for hundreds of years and it’s certainly a hearty base for many a dish, especially this time of year.